This is something personal. Why to read this entry? Well, reading a bit about my experiences with computers will give you an idea of what I’m interested in and which direction things are likely to take. Also you perhaps like a little nostalgic retrospect? If not, skip this. My dad bought his first pc way back when these were rather expensive and it was not at all common that a family had one. I was a child who could not yet read or write, but I was immediately hooked by this new machine. I enjoyed the simple games that the 80286 offered and didn’t mind that it was all black and white. The first letter I got to know was actually “y” (a VERY uncommon one in German) – the key I had learned to press when a game asked something like “would you like to try again”? The first operating system I remember was MS-DOS 5.0 – but it’s basically the memory of the less advanced prompt. I got a little older and computers fascinated me even more and more. Soon we had Windows 3.0 and I was often playing around with Paintbrush (more or less the same thing as nowadays’ Paint). 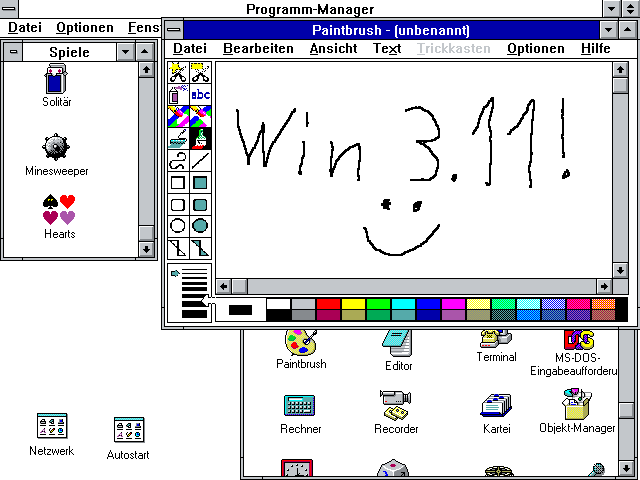 Windows 3.11 (Ger): Main window with groups, icons and Paintbrush open. At one point my father sold his 286 and bought a 386. Quite some time later, when the new 486 pcs were released, he bought one, too – but instead of selling the old 80386, he gave it to me. My very first own pc! Over time I taught myself a lot by watching or asking my father and by trying out things on my own. Soon I was rather familiar with my DOS 6.22 and Win 3.11. After school I usually turned on my pc and played games or did other things with it for hours. Remember Lemmings, Commander Keen, Monkey Island, X-Wing/TIE Fighter, WarCraft and many other classics? Since this is where it all begun for me, I still love DOS and DOS games to this day! WarCraft: Orcs & Humans – Water Elementals destroy an Orcish base. Then we got Windows 95. I remember well that I was very excited and got into this new OS quickly. Being all graphical and mouse-driven, I felt that it already lacked something… It just wasn’t the same thing anymore – a bit of the pc’s “magic” was gone (and would vanish more and more over the years, drowned in overly colorful rubbish). Of course, Win 95 came with quite some useful features and so I liked the system (weren’t we all used to the “blue screen of death” phenomena back then?). Well, and it allowed to boot into pure DOS. So everything was fine for me. Also DirectX and a few other new components made very nice new games possible and I certainly had a great time. My younger brother got his own pc, too, and finally my father gave in and bought three ethernet cards. 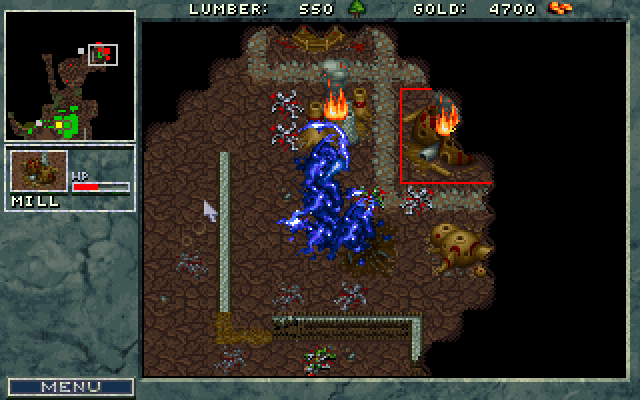 I got addicted to play multiplayer matches with friends and finally my parents forbid it since we were occupying my brother’s pc a little too often… I also got into map-making with WarCraft II thanks to the editor that came with it. In school I became friends with a class mate who had taught himself to code. We had a lot of fun with several smaller projects. I also learned to write small programs in qBASIC and later a little Pascal and Delphi. 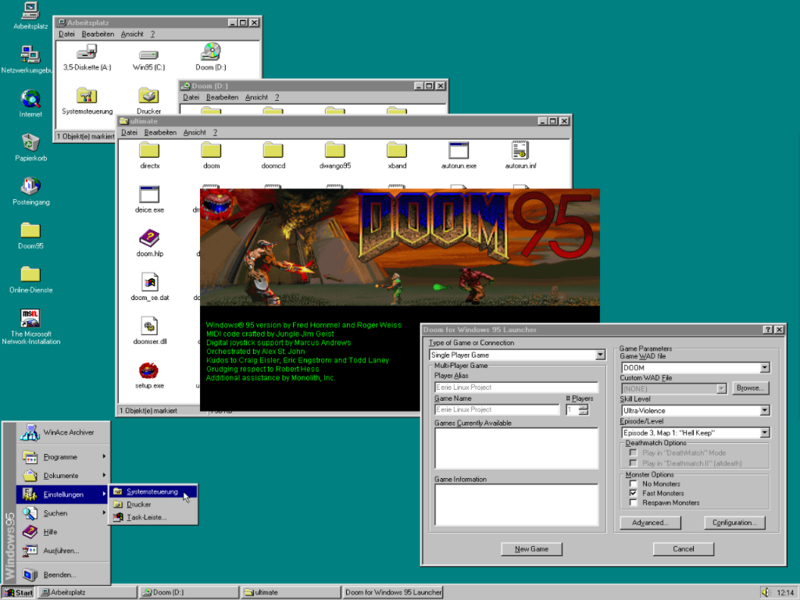 Doom95 launcher on the Windows 95 operating system (German). Next I switched to Win 98 (SE, since I knew the FE was extremely unstable). This was about the time when many of my class mates got their first pc. Even years later, I was shocked how little they knew about computers even though they spent a lot of time with them. They couldn’t write a single batch file and if Windows didn’t start… Well, being left with a command line and no mouse they were about to panic! I’m still very grateful that I learned DOS and didn’t start with a graphical system and Win 9.x or even later! A bit later I was mapping for Jedi Knight with a program called Jed which I found on a compilation CD. This may actually be the first piece of free software of which I was aware that it was coded by enthusiasts instead of regular companies. I thought that this was a great thing and that more people should publish their programs for everybody to use. Then my father decided that it was time to get an internet connection. Since only his pc could connect to the net, I was not online too often, but it was another very interesting thing, too! Especially since there actually was more free software to try out and enjoy! Next I got Windows 2000 and honestly, I liked the system a lot. There were a few downsides like it being not really suitable for gaming and of course the missing DOS. Oh yes, and I still can’t understand what the hell M$ was thinking in terms of the console… They added some really nice functions that could be great for batching – and at the same time removed CHOICE.COM! Doing so they mindlessly ripped out the heart of batching! Luckily there was the FreeDOS project on the net which provided a CHOICE replacement that I could freely distribute. Soon I configured my pc as a multi-boot machine with Win2k (working) and 98 (gaming). This was the last time when I was quite happy with my Microsoft powered system. So much for the rather nostalgic part. The next entry will be the second part of this topic. Wow, a new blog! And it’s about Linux… How very original. Yes, of course – there are thousands of blogs about similar topics. So why this one? Well, probably because “Eerie” could be an interesting and informative project. Alright, so what’s it all about? It’s primarily about a little (?) experiment of mine. It could be interesting or at least entertaining – and might even rise to another level. But let’s stick to the present. I asked myself what the process of creating a new Linux distribution really was like. After reading a little about that topic on the net, I came to the simple conclusion: Try it out yourself and you’ll learn the most from it! …admit that a little bit more knowledge about GNU/Linux would be helpful! So he sets out on a long and adventurous journey, striving to learn and understand a complex and powerful system. First he downloads and installs Ubuntu as a second OS. He explores everything and tries to get into it. He kind of likes what he sees and soon he’s busy searching for applications that are similar to the ones he is used to. After a while he notices that he hasn’t booted windows in quite some time and that he might as well erase its partition. He formats it as EXT3, finally doing something useful with it and gaining some more disk space. Next he downloads K/L/Xubuntu and gives the live-cds a try. After choosing the desktop that fits his taste best, he begins looking for software again. (Almost) everything is nice and he can work well with his pc. But reading stuff on the net he regularly stumbles across things he just doesn’t understand. So he tries out Debian, SuSE and a few other distros known to be beginner-friendly. After all he wants to get an idea what that “distribution” thing is actually all about. Not satisfied with the knowledge that he gained, he begins to learn the BASH, to read about the Filesystem Hierarchy Standard, etc. The impressive world of GNU/Linux begins to grow bigger and bigger before his eyes. Content with his new skills only for a short time, he soon starts looking for something else. What about a distro for experienced users? Right, that’s it! Hm… Arch Linux or perhaps Gentoo? “Rolling release”, “stage-3 archive”, “source distribution”… No idea – but it sounds great, doesn’t it?! Having compiled his first own kernel (with quite some settings wrong) he feels great and when his first Gentoo system booted up, he’s really proud for the rest of the day. Now he’s playing around with his new system every night until the early hours of morning. Still not happy, he learns about the existence of Linux From Scratch. Now that must be the ultimate experience: building the entire LFS system completely by yourself and learning what each component is really supposed to do and how it works! After having build LFS for the second time (this time only looking up stuff in the book when he got stuck) and taking a peek at BLFS, he wonders what to do next. Building LFS for a third time, entirely by heart? Trying out some super-insane hacks? Found his own distribution? Get some software to run on an architecture it wasn’t meant to work with? Hey, wait a second! What’s wrong with creating a new distribution just for the sake of learning something by doing so? There’s a lot to learn in the process, that’s for sure! But honestly – how do you actually start a new distro? Hm. Well, I guess… No! That’ll be part of a later blog entry! So my first goal of the “Eerie” project is to improve my Linux knowledge. And in the end I’d like to create a live-cd with an extremely light-weight but still nice desktop system. Nothing revolutionary? Probably not. But I think that I have quite a few rather original ideas. Stay tuned! Anyway I thought that I might well share my discoveries, my thoughts and failures with anybody interested. I’m not at all a Linux expert and not even a coder, which will very likely lead to huge problems sooner or later… More about the prerequisites in another post. I’m just going to try it out anyway and perhaps somebody will lend me a hand when I get stuck? We’ll see. So what you can expect here: A few thoughts about IT topics, a little about operating systems in general and a lot about my experiments with Linux. Well, and of course one more thing – as even the name of the project suggests, there’ll always be some tongue-in-cheek comments on various things! I’d like to explain what “Eerie” stands for soon and describe the project a little bit more in detail. The next entry will have the title: “First things first – how I came to Linux”. Any feedback on my project or blog is very welcome!